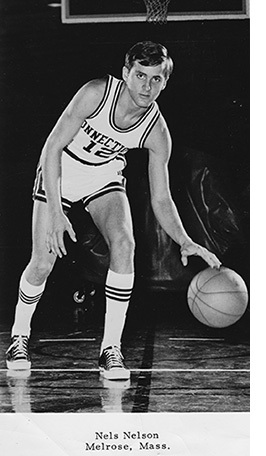 Nels Nelson was a Guard for the UConn Huskies from 1969 - 1972. His career consists more of memorable influential people and experiences than records and statistics. Nels has been a player, coach, mentor, contributor and teacher both on the court and off. He refers to himself as "the classic little fish in a big pond." Nels first interest as a young boy was baseball. There was turmoil in the home as his parents were divorcing and going outside to play baseball was a safe zone for him. He found it difficult to hit fly balls to himself but when he discovered basketball and he could play the game by himself and he was even better at it than baseball, it became his sanctity. Nels first coach in basketball was in the eighth grade, Daniel Gallagher. "Mr. G. opened the gym at 6:00AM for us to practice. Most of the guys would come in tired and I would be up at 4:00AM wide awake thinking, only two more hours to go." The next person who left a lasting impression on Nels was Agnes Darling, one of his teachers. Nels was struggling in the classroom and misbehaving due to his family issues. Miss Darling brought him to the basketball court; she'd practice basketball skills with him as she taught the classroom lesson plan. "It is basically the same message that she was giving in the classroom except now it's a home court, so now I'm listening and obviously her credibility skyrocketed." When Nels reached Melrose High School his coach was John Killilea who went on to have a successful career. "In my junior year we won the state championship, quite a highlight to be on a state championship team." Nels was the first guard off the bench on the championship team that consisted of mostly seniors. In Nels senior year the team wasn't great but Nels was good. "I had a great individual year averaging 20 points a game from a state championship team, so it got a lot of people's interest, and I got a lot of college letters." Nels frequently watched UConn on television. When he saw UConn's Toby Kimball playing against Rhode Island University he just fell in love with UConn. "UConn sent me a letter and my mom and I went to UConn for a visit." Nels wasn't offered a scholarship, rather was offered to try out for the freshman team and was told if he made the team, maybe down the road there would be a scholarship. He made the team but didn't see any playing time. "I'm not playing, my career is about to be over, I'm scared to death because basketball is my life time passion. Low and behold Coach Burr Carlson gets fired and who comes on the scene but Coach Dee Rowe, the next influential person in my life." Nels had to try out for the team where he dove for balls, hustled like everyone else and made the team. He asked Coach Rowe what it was about him that stood out and coach said it was Nels passion that got him on the team. "I made the team with my attitude and passion." 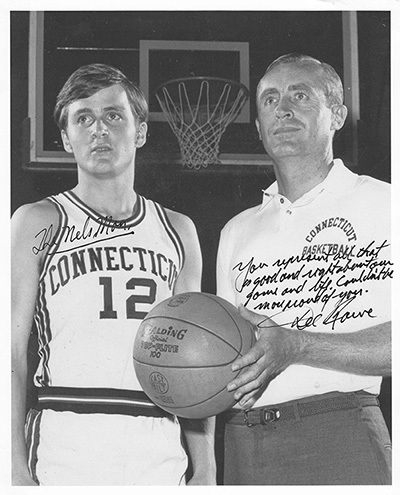 While at UConn Nels experienced winning the 1969 New England Championship, scoring eight points in a game against Jim Boeheim (Syracuse University player/coach) and holding Dr. J (Julius Erving) to two points while guarding him. Both of these references are meant to be humorous. The eight points were in the last three minutes of an already decided game and the two points Nels held Dr. J to, were after only guarding him for one possession. He scored the two points off Nels then Dr. J was taken out of the game with only a few minutes left of an already decided game. Nels is also proud of being the first recipient and only co-recipient with Steve Bell of the Jimmy Zbell trophy awarded to a University of Connecticut senior. "I was there to be with a man of color, something that made me really proud." While Nels was finishing up some academic work as a fifth-year student, he was a graduate assistant for the basketball team. During this time Coach Rowe became aware of an assistant coaching position at St. Thomas More Prep School, Oakdale, CT that he helped Nels to get. In his first year as an Assistant Coach Nels described it as "a great team that won a New England Prep School Championship." Nels also coached the "B" Team which was a great learning experience. Next a coaching position opened at Stonington High School. Again, it was Coach Rowe that discovered it and pursued it for Nels. 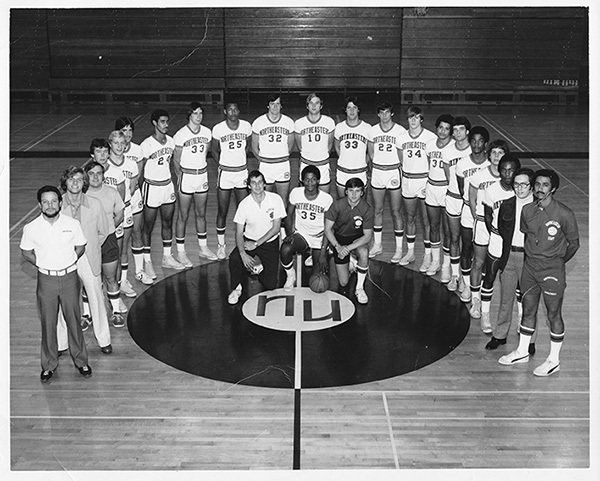 The year prior to Nels, the team had 0 wins and 19 losses. Nels first year as head coach his record was 12 wins and 10 losses followed by his second season 14 wins and 6 losses. At the end of the season Nels gets a phone call from Jim Calhoun who asks Nels if he'd be interested in being an assistant coach as Coach Calhoun was becoming the head coach at Northeastern University. Nels is 25 years old as an assistant for Jim Calhoun who is 29 years old. Nels stayed as an assistant for four years and at that time, made the decision it wasn't for him. Nels left basketball to pursue an opportunity working for General Electric. It didn't take him long to realize that corporate america wasn't for Nels. His next career move was as a Physical Education/Health Education teacher (now often referred to as Health and Wellness Education) where he spent the next 28 years. "I had the chance at three careers and I ended up choosing the career that paid the least and rewarded the most." He taught drug education, sexuality education and dealing with issues like suicide and eating disorders. "My three goals were to have a lot of variety, get the students involved and make it interesting." 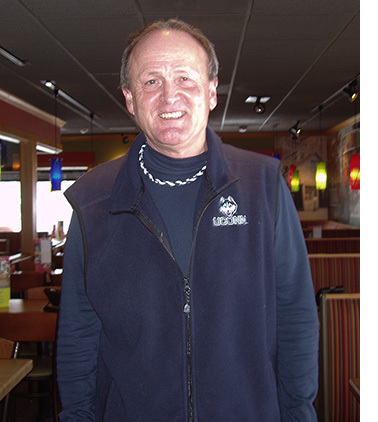 When asked how UConn has contributed to his life, Nels responded, "It just sets you up. No matter what you do in life you are on some kind of a team so it's about being a team player." Nels thoughts on how basketball has changed over the years are that when he was in college there was a freshman basketball team and a varsity basketball team and that was good, but it won't be brought back because it would cost too much. Another change over the years has been the addition of the three-point shot. Nels thinks the three-point line should be moved further away from the basket due to the accuracy of the players shots. With his experience of being an assistant coach and a head coach Nels commented about the coaching styles over the years, "Coaches yell at the referees more and get away with it. The refs are in such awe of the coaches, they want to be selected to ref the game, so they put up with the yelling." Nels met his wife Ann in high school. He was the basketball player and she was the cheerleader. They been married for 45 years and have two children, Amy and Nels Timothy, known as Tim. Tim has two young daughters, Samantha and Zoey. Nels remains busy during his retirement. "I have what I call a 4G program; golfing, gym, grandchildren and Give. Give is anything I do for other people." In reflecting on his career Nels said, "I have just been so fortunate that basketball has come into my life and the people in basketball that have come into my life at exactly the right times beginning with Daniel Gallagher opening the gym, to Agnes Darling bringing her lesson plan to the basketball court. In high school playing for John Killilea, winning a state championship and Coach Rowe at UConn who recognized my attitude to earn my spot on the team." 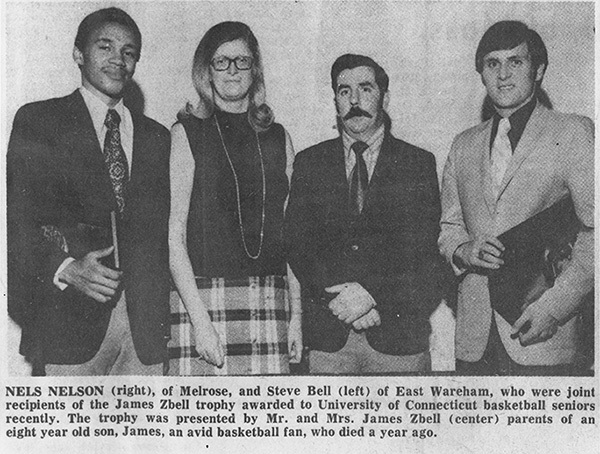 Nels was a member of the UConn team that won the 1969 Yankee Conference Championship, an assistant at St Thomas and wins the New England Championship, in the New England Melrose High School Hall of Fame and soon he is being inducted into the New England Basketball Hall of Fame as a contributor having coached and played in Connecticut and Massachusetts. He was an assistant for the legendary Coach Jim Calhoun and once had a rare opportunity to be one on one in a coach's luncheon with the legend of all legends, Coach John Wooden. Nels said, "I've had the chance to rub elbows with royalty is the best way to describe my experience."